Carol covers the nature of the American National Mammal, the bison, and the nutritional qualities of the food they provide. Pictures in the book provide a window into the life of the buffalo on a farm. Heartwarming stories through the book will keep you rooting for the buffalo babes. 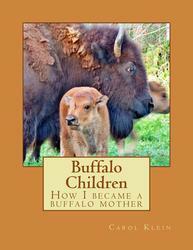 The book is intended to mentor new farmers as they endeavor to learn how to best raise and handle bison on the farm. Readers will become aware of how food is raised and issues of health, nutrition, food safety and animal welfare. Buffalo Children stories will warm your heart and encourage the restoration of the American Bison. Hello and Welcome To Oakcreek Buffalo Ranch. You have found Carol Klein in the Ozarks in the Southwest corner of Missouri where I make my home with two dogs and about 60 American buffalo. Make yourself at home and stay awhile. There is lots to see and learn about here at the farm on the web. Please feel free to contact me with any questions, as I would love to hear from you! And be sure to stop by the farm if you are in our area. If you call first, 1-800 477-4434, I'll make a point of being home so that you will not be disappointed and can give you directions for the easiest way to get here. Buffalo meat is available at our farm in Missouri just North of Bella Vista, AR., and an hour south of Joplin, MO. Meats are sold by the pound, frozen, in burgers, steaks and roasts. You will also find treats such as jerky, and brats. Please check our PRICE LIST page for more information. 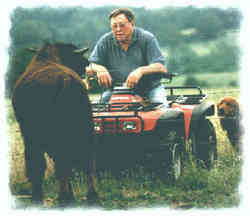 In loving memory....... Leon Klein passed away from cancer on April 17, 2010 in his home at Oakcreek Buffalo Ranch. He and Carol were married for 43 wonderful years. Have you ever considered raising buffalo yourself? Feel free to call Carol with any questions or concerns you may have. Please feel free to email with any questions you may have about bison.